Looking to explore new creative possibilities or to get a better understanding of what it takes to deliver content that will resonate with today’s tech-savvy audiences? 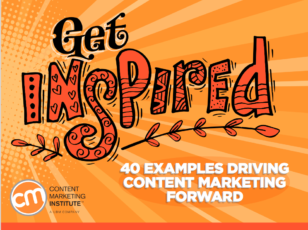 We’ve gathered some of our favorite content marketing efforts into a new e-book, Get Inspired: 40 Examples Driving Content Marketing Forward. Updating one of our most popular e-books of all time, each example features a teachable moment for marketers looking to broaden their horizons and increase the appeal and impact of their content. From fresh takes on content marketing mainstays like blogs and e-books to cutting-edge innovations that capitalize on the latest digital media technologies and trends, you’re bound to find something that will inspire your next great content marketing success. We hope these insights and examples will motivate you to explore some new ideas and approaches of your own.